"Right before your eyes and beyond your wildest dreams." 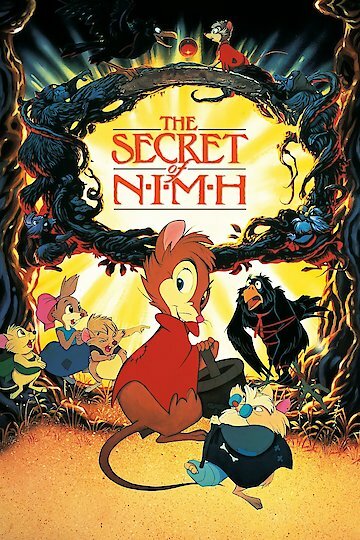 The Secret of NiMH is about a timid field mouse named Mrs. Brisby, who must move her family out of the fields when plowing time begins, but she soon discovers that her son, Timothy, has become very ill. After a doctor mouse gives her medicine for Timothy and tells her that he must stay inside for at least three weeks or he will die, Mrs. Brisby embarks on a journey to save his life. When Mrs. Brisby discovers that the plowing has been started early must devise a plan that will give her son the time he needs to recover from his illness. Along the way she meets a host of interesting characters including a group of rats that were once part of laboratory called NIMH (National Institute of Mental Health) and that they can only survive with the help of human technology which they have to steal. The Secret of NIMH is currently available to watch free on Tubi TV, Vudu Free and stream, download, buy on demand at Amazon Prime, Tribeca Shortlist, Amazon, Vudu, Google Play, FandangoNow, iTunes, YouTube VOD online.